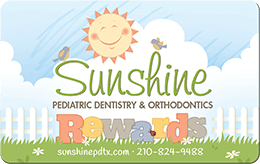 At Sunshine Pediatric Dentistry, we do everything we can to help your child avoid cavities, or “sugar bugs” as we sometimes call them with our littlest patients. Tooth decay is a big concern with kids because they’re still learning the best way to brush and floss their teeth, and they often love digging in to sweet treats. One of the ways we can safeguard against cavities is with dental sealants. A dental sealant is a thin, protective coating that we apply to the back teeth (the ones used for chewing and normally the hardest ones to clean thoroughly). They are generally clear or white in color. Like their name suggests, a dental sealant effectively “seals out” tooth decay so it doesn’t settle in those little crevices on top of the molars and lead to cavities. Both adults and children can benefit from sealants. Many dentists recommend that kids get sealants on their permanent molars as soon as they come in. Children without sealants are more likely to get cavities. Getting a dental sealant is quick and painless! First, we will clean and dry the tooth to be treated. Then, we’ll apply a bonding gel to help the sealant attach to the tooth. Finally, we’ll rinse off the gel, apply the sealant, and harden the coating with a special light. Dental sealants are meant last for several years. We’ll check their condition during routine check-ups, and we can reapply them as necessary. Yes! Dental sealants are a safe and effective preventive treatment option. At Sunshine Pediatric Dentistry, your child’s health and safety are our top priorities, and we would never do anything to put that in jeopardy. We are proud to provide BPA-free protective sealants to ensure that your child isn’t exposed to any harmful toxins. We can help your child avoid cavities!